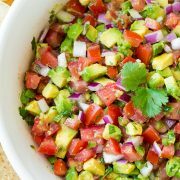 The Best Homemade Salsa Recipe! This homemade restaurant-style Salsa is one of my most frequently made recipes! 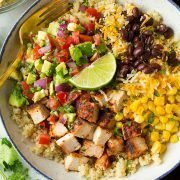 It’s perfect served with tortilla chips or as a topping over your favorite Mexican food, like tacos, burritos, taquitos and so forth. The best party food around and a must-have snack! Fact: the best salsa is made with fresh tomatoes. Okay, that’s just my opinion, but in the past I thought I could go the route of using all canned tomatoes, but using fresh tomatoes makes a world of difference! 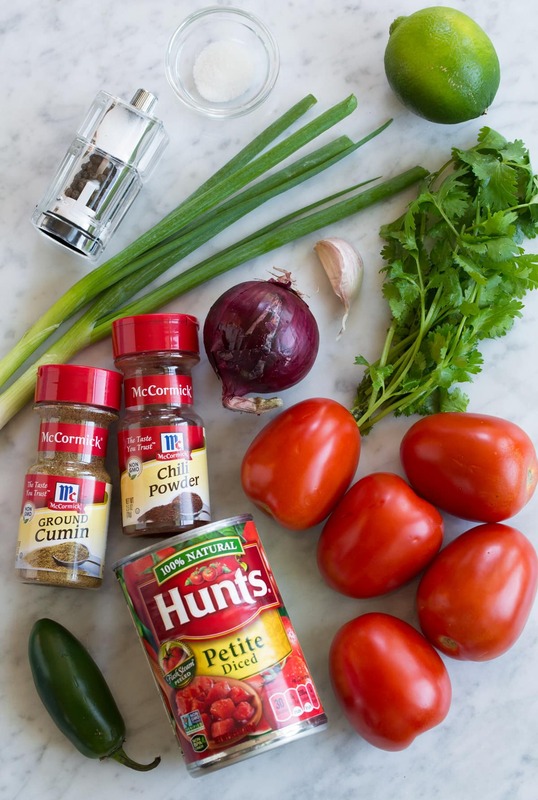 Fresh tomatoes make the best salsa, especially when you use nicely ripened in season tomatoes. 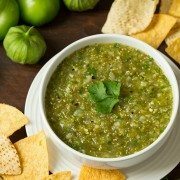 This is hands down my favorite salsa recipe, and I don’t know that I’ll ever need another one. It just has the perfect ratio and blend of everything. It’s not too oniony or garlicy, nor too spicy for my kids, it doesn’t tasting like it came from a can and it has the perfect brightness with the fresh lime. Then it has a classic Mexican flavor with the cilantro and hint of chili powder and cumin. The sugar I’d say is only needed if you are using store-bought tomatoes. If you grow your own or buy them at the farmers market, the quality is a bit better and they’re a bit sweeter so the sugar isn’t needed. Fresh Roma tomatoes – use the nice and red ones, avoid anything soft. Canned tomatoes – I like to use canned in addition to fresh because it gives the salsa a better consistency. Fresh cilantro – cilantro adds key flavor, don’t omit this! Jalapeno – this adds a nice kick. If you don’t like heat you can replace it with 1/4 cup chopped bell pepper, or omit. Red onion – yellow onion can be used here as well. Green onion – if you don’t want to buy both kinds of onions you can omit the green onions and add just a little more red onion. Garlic – it may seem small but garlic packs a flavorful punch. Only use fresh garlic here for best flavor. Lime – this really brightens up the salsa. Chili powder and cumin – I don’t always add these but they’re a nice addition if you have them on hand. Sugar – just a touch balances out the acidity of the tomatoes and lime. Salt and pepper – the salsa would taste flat without the salt and the pepper adds a light kick. Roughly chop the vegetables (and fruit if you want to get technical, those tomatoes). Add vegetables to a food processor along with spices and lime juice. Chop in quick bursts until it’s finely chopped up. 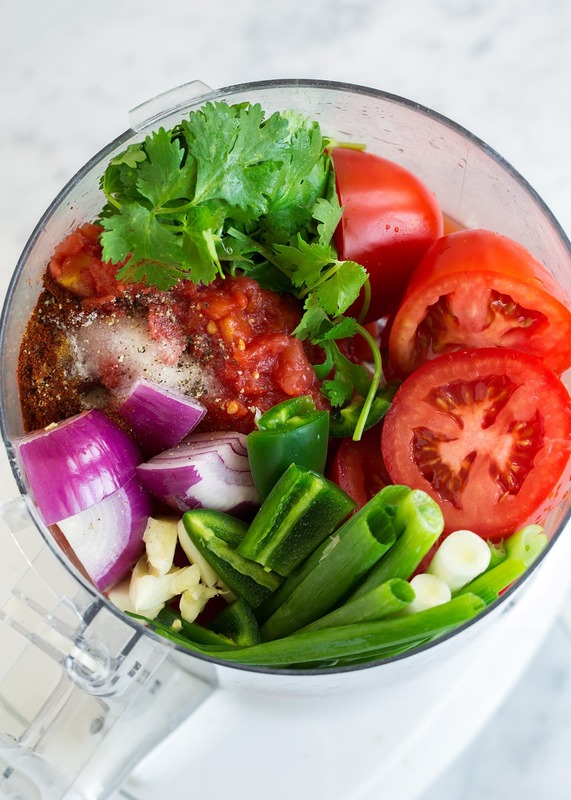 This salsa can also be made in a blender. Or you can even finely chopped up the vegetables by hand then stir everything together in a bowl. What to go all out? Try this with homemade tortilla chips, fried or baked. Everyone will be totally impressed! I don’t make them often, but when I do it makes the fresh salsa that much better. How Long Will Salsa Last? This salsa should last for up to a week if stored in a sealed container in the fridge. What Type of Canned Tomato Should I Use? I love this salsa with canned plain tomatoes, canned tomatoes with green chilies, or canned fire roasted tomatoes. All work great, just use what you have. Dont puree the salsa, some texture is a good thing here. 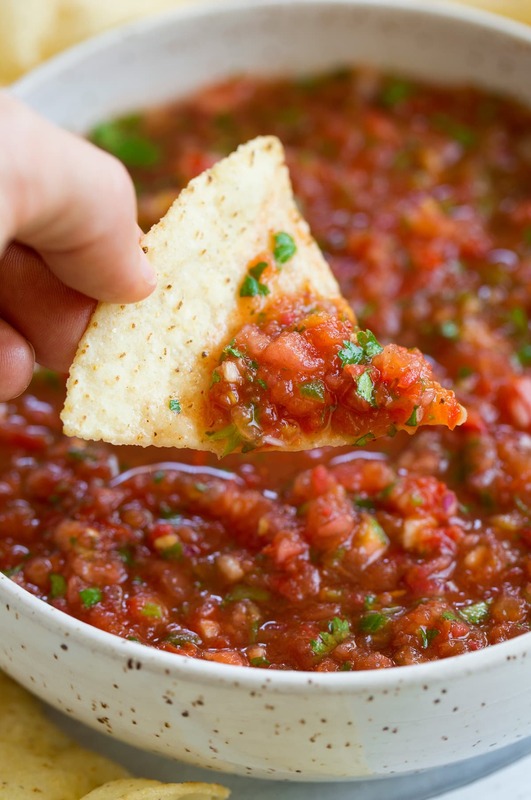 Let the homemade salsa chill first for an even tastier, more refreshing salsa. I just always seem to like it better the second day. 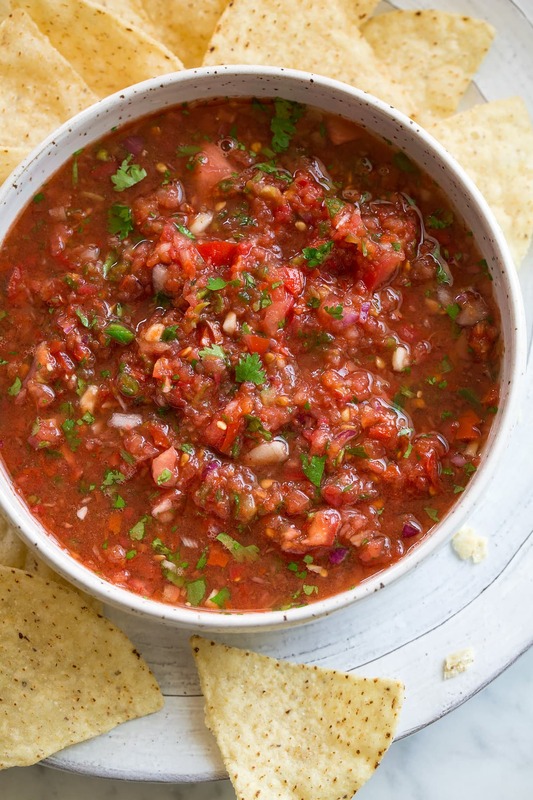 A super easy, super fresh, super delicious salsa. 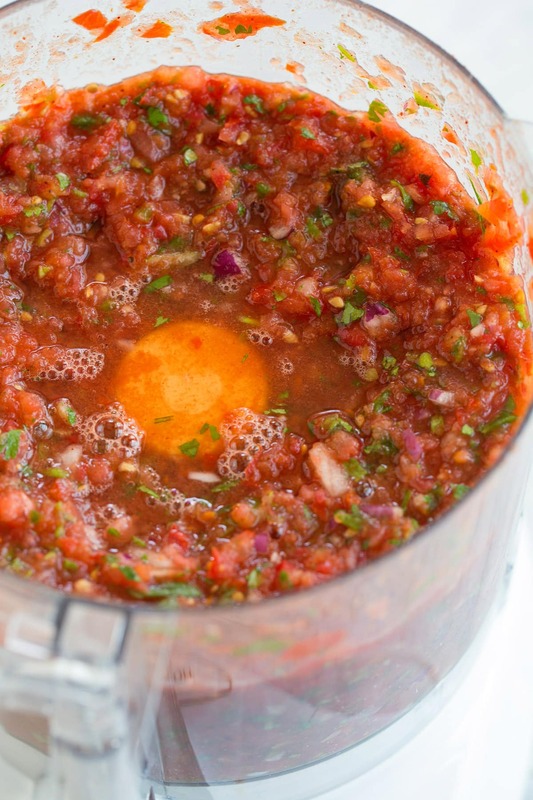 You'll never need another salsa recipe again! This has been my go-to recipe for years, it's definitely a family favorite. We make it almost every week. It's a staple recipe. Combine all ingredients in a food processor and pulse in 1 second bursts until all ingredients are finely chopped. Serve with tortilla chips. Store in refrigerator up to 1 week. *Canned diced tomatoes with mild green chilis, or canned fire roasted tomatoes also work great as well. 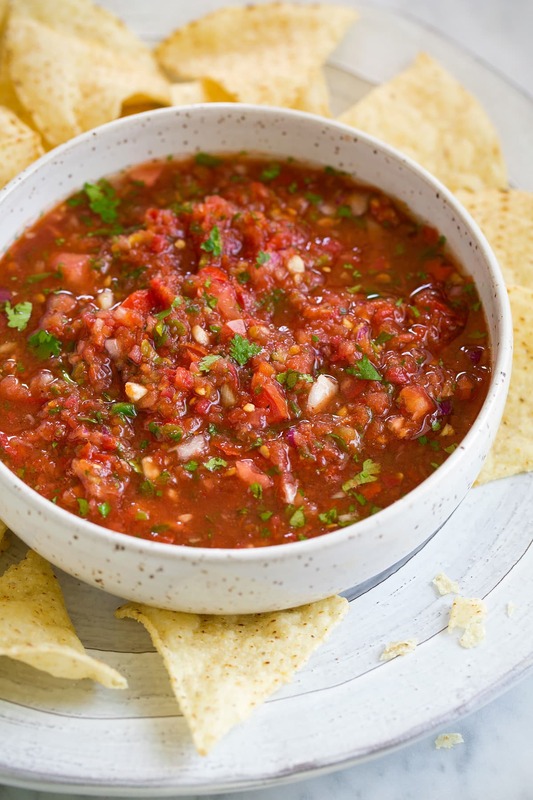 For a thinner salsa, you can add in a bit of tomato juice or tomato sauce if desired.